At any time during the game, pull out Niko's phone and dial any of the numbers below for the corresponding effect. Note that cheats affect your missions and achievements, so either complete your achievements first or use a different profile to cheat. 1) This set of weapons includes a knife, Molotovs, pistol, pump shotgun, micro SMG, assault rifle, combat sniper, and RPG. 2) The other weapons set comes with a grants baseball bat, grenades, combat pistol, combat shotgun, SMG, carbine rifle, combat sniper, and RPG. 50 Percent Off for All Clothing Stores: Get 80 percent Relationship Status with Alex. Boom? (Call Packie to request that he make you a car bomb): Gain 75 percent friendship with Packie. Chopper Ride: He will pick you up in his helicopter. Gain 70 percent friendship with Brucie. Discount Guns: Buy weapons at a cheaper price from Lil Jacob. Gain 60 percent friendship with Little Jacob. Extra Help: A car of gang members will be sent to help you. Gain 60 percent friendship with Dwayne. Free Ride: Call for a taxi. Gain 60 percent friendship with Roman. Health Boost: Call Carmen and select "Health Boost." Get 80 percent Relationship Status with Carmen. Remove Up to 3 Wanted Stars: Call Kiki and select "Remove Wanted." Get 80 percent relationship status with Kiki. Easy Money: Find an ATM, cause a traffic jam, and block the roads so that an ambulance can't get through. Let a person or two get money from the ATM and then kill them. Pick up the money, walk away, go back, and the money will be there. You can repeat this action. Get a Statue of Liberty T-shirt: While walking, visit the Statue of Liberty and go up to the second floor where you'll see a door. Go through it, and the game will load. When you come back through the door, you'll have on a new shirt. Repairing the Engine: Call 911 if your car doesn't work, and your vehicle will start. Map Locations: Use this URL (in-game via an internet cafe) for weapon, health, armor, vehicle, pigeon, ramp/stunt, and entertainment locations: www.whattheydonotwantyoutoknow.com. Guilding Glitch: You can get under the city in "GTA 4" by going to the building with all the lights and then, on one side, entering into the building and down with the helicopter. GTA Graffiti: Across from Bank of Liberty is a house with graffiti that shows some "Grand Theft Auto" video game titles. OG Loc CD: You can find a CD by OG Loc from San Andreas in your Bohan safehouse. 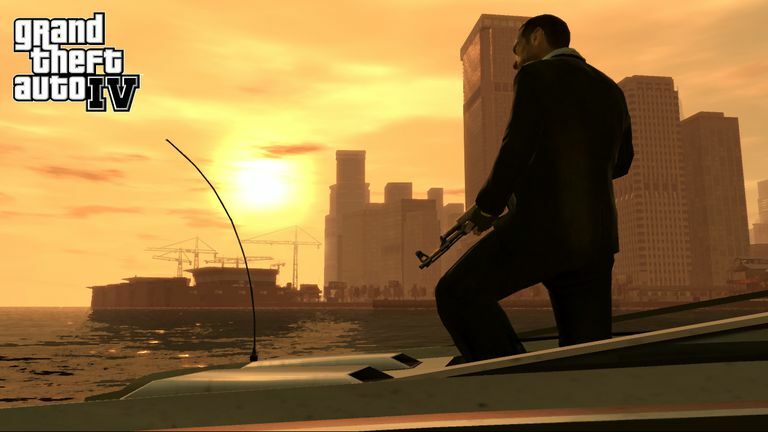 Fast Reloads: To get faster reloads in "GTA 4," switch your weapon and then switch it back. When you have access to Happiness Island, find the helicopter tours and take a helicopter. Fly the helicopter to the Statue of Liberty and jump out at the statue's feet. Go around the platform until a door appears with signs on both sides, reading, "No Hidden Content Here." Go through the door, and you'll find a tall ladder; climb it. At the top, you'll see the heart beating between chains. Drive a car into a large traffic jam. Blow the horn once to the beat of "Shave and a haircut" and then stop. Wait while another car responds with "two bits." Go to Happiness Island and run up to the base of the statue. Locate the shirt on the ground and pick it up to read that it says "Happiness" on one side and "land" on the other. The following achievements can be unlocked in "GTA 4" on the Xbox 360 console. To unlock an achievement and the gamerscore points, perform the indicated task. Annihilator Helicopter: Kill all 200 flying rats. Rastah Color Huntley SUV: Complete 10 package-delivery missions. Remove Ammo Limit: Get 100 percent completion in the game. Assassin's Greed: Complete all nine assassin missions (worth 20 points). Auf Wiedersehen Petrovic: Win all ranked multiplayer variations, all races, and Cops 'n' Crooks, as both sides (worth 30 points). Chain Reaction: Blow up 10 vehicles in 10 seconds. Cleaned The Mean Streets: Capture 20 criminals through the police computer (worth 20 points). Courier Service: Complete all 10 package-delivery jobs (worth 10 points). Cut Your Teeth: Earn a personal rank promotion in multiplayer (worth 5 points). Dare Devil: Complete 100 percent of the unique stunt jumps (worth 30 points). Dial B for Bomb: Unlock the special ability to phone for a bomb to be placed (worth 10 points). Driving Mr. Bellic: Unlock the special ability of taxi (worth 10 points). Endangered Species: Collect every hidden package (worth 50 points). Fed the Fish: This is worth 5 points. Complete the Mission "Uncle Vlad": This worth 5 points. Finish Him: Complete 10 melee counters in four minutes (worth 15 points). Fly the Co-op: Beat Rockstar's time in ranked versions of Deal Breaker, Hangman's NOOSE, and Bomb da Base II (worth 5 points). Full Exploration: Unlock all the islands. Genetically Superior: Come in first in 20 single-player street races (worth 25 points). Gobble Gobble: Score three strikes in a row (a turkey) in 10-pin bowling (worth 10 points). Gracefully Taken: Complete the mission "I'll Take Her" (worth 10 points). Half Million: Reach a balance of $500,000 (worth 55 points). Impossible Trinity: Complete mission "Museum Piece" (worth 10 points). It'll Cost Ya: Complete a taxi ride without skipping from one island to another (worth 5 points). Join the Midnight Club: Win a ranked multiplayer race without damaging your vehicle too much and have damage enabled (worth 10 points). Key to the City: Achieve 100 percent in the "Game progress" statistic (worth 100 points). King of QUB3D: Beat the High Score in QUB3D (worth 15 points). Let Sleeping Rockstars Lie: Kill a Rockstar developer in a ranked multiplayer match (worth 10 points). Liberty City (5): After you meet all friends, the ones left alive like you above 90 percent (worth 20 points). Liberty City Minute: Complete the story missions in less than 30 hours (worth 30 points). Lowest Point: Complete mission "Roman's Sorrow" (worth 5 points). Manhunt: Complete the most wanted side missions from the police computer (worth 15 points). No More Strangers: Meet all random characters (worth 5 points). Off the Boat: Complete the first mission (worth 5 points). One Hundred And Eighty in a Game of Darts: Score 180 with only three darts (worth 10 points). One Man Army: Survive five minutes on six-star wanted level (worth 40 points). Order Fulfilled: Complete all 10 Exotic Export orders (worth 10 points). Pool Shark: Beat a friend at pool (worth 10 points). Retail Therapy: Unlock the ability to buy guns from a friend (worth 10 points). Rolled Over: Do five car rolls in a row from one crash (worth 30 points). Sightseer: Fly on all helicopter tours of Liberty City (worth 5 points). Taking It for the Team: Be on the winning team in all ranked multiplayer games (worth 10 points). Team player: Kill five players who are not in your team in any ranked multiplayer team game (worth 10 points). That Special Someone: Complete the mission "That Special Someone" (worth 10 points). That's How We Roll! : Unlock the special ability of a helicopter (worth 10 points). Top of the Food Chain: Kill 20 players with a pistol in a ranked multiplayer deathmatch (worth 10 points). Top the Midnight Club: Come first in 20 different ranked standard multiplayer races (worth 20 points). Under the Radar: Fly underneath the main bridges in the game that crosses the water with a helicopter (worth 40 points). Walk Free: Lose a four-star wanted level by outrunning the cops (worth 50 points). Wanted: Achieve the highest personal rank in multiplayer (worth 20 points). Warm Coffee: Successfully date a girl to be invited into her house (worth 5 points). You Got the Message: Deliver all 30 cars ordered through text messages (worth 20 points). You Won! : Complete the final mission (worth 60 points).